One day, Peter approached Jesus and asked Him, “Lord, how often will my brother sin against me, and I forgive him? As many as seven times?” To which He responded, “I do not say to you seven times, but seventy times seven” (Matt. 18:21–22). In that day, many teachers recommended not more than three times, so Peter might have thought he was being generous. But Jesus’ answer does away with all limits — such is the nature of God’s free forgiveness. Too often in churches today we are more concerned with retribution than wholesale forgiveness, as one look at the fragmented church will show. 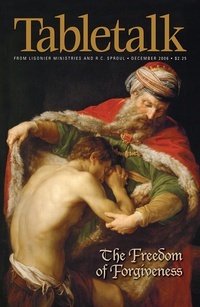 For this reason, the December 2006 edition of Tabletalk is concerned with forgiveness as a necessary component of healthy church life. This issue will serve to exhort Christians to be as free to forgive as God is with us. Contributors include R.C. Sproul along with Rich Ganz, Rod Mays, Joseph V. Novenson, Burk Parsons, R.C. Sproul Jr., and Gene Edward Veith. Tabletalk features articles about topics central to the Christian faith and daily, in-depth Bible studies. The 2006 Bible studies take a careful look at the book of Genesis.